The general rule is, when you explain the joke, it makes it less fun. But like so many things, Joss Whedon is the exception to the rule. And who knew there would be a deeper explanation to Tony Stark's Shawarma line in the Avengers? And who would have guessed that Nicholas "Xander" Brendon would have been the one who basically wrote the joke? And that Whedon would wait fifteen years to use it. Hit the jump for a ridiculous Avengers 2 rumour that is barely worth reporting on. OK. The Daily Mail, who obviously have their finger on the pulse of Joss Whedon's plans for Marvel, have reported that the director and the company are interested in including Ms. Marvel in the Avengers sequel. And, that they are looking at Ruth Wilson (Luther, the upcoming Lone Ranger) or Emily Blunt to fill the role. I've mentioned before that I hate reporting crap like this, because it means nothing. This is nonsense from start to finish. First off, Whedon might be working on a first draft in his head, but Marvel isn't anywhere near casting for a movie three years away. Add to that the British paper has named two British actresses, both of which are brunettes, to play the American blonde. The only thing this report got right is the inclusion of Ms. Marvel, AKA Carol Danvers, in the Avengers 2. She's the obvious choice, being the highest profile female character in the Marvel catalogue, powerful enough to go toe to toe with Thor, and acquired her powers from alien technology. Whedon has stated that his sequel will increase the number of female characters before anything else, and the one major failing of the Marvel Cinematic Universe thus far has been the complete lack of female heroes in lead roles. Blunt would be a fine choice for Jessica Drew, the Spider-woman, though that character would fit better into the SHIELD series or a Captain America sequel. And Danvers should be included in the Avengers sequel. But I would, and have, argued that she would be the best choice to lead the upcoming Guardians of the Galaxy film, and migrate over to Whedon's follow up. As to who should play her, I've mentioned this before. You can go one of two ways. First, you can get a big, established name (the Downey Jr. path). 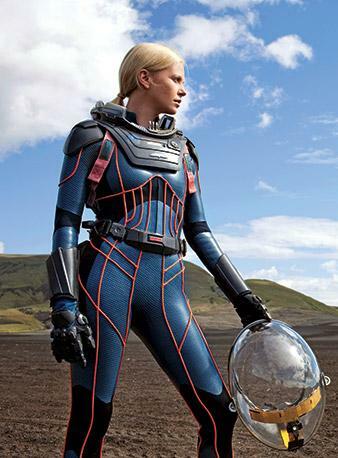 In which case I'd argue for Charlize Theron. Or, you get a relative unknown (the Hemsworth path). In which case I'd go for Joelle Carter. To support my choices, I provide only two pieces of evidence, which I feel speak for themselves. Via The Mary Sue and Den of Geek.